I had to merge 2 word documents once. They were both in word 2007(open xml) format. I searched online everywhere for a way to merge them. All the links were about using the altChunk element. I have a problem with that. The entire document gets put in there and that is a lot of unneeded data(like header and footer etc.). This is my implementation of a radix tree data structure. This is a data structure very similar to a trie. Basically instead of having each one of your nodes hold a char you have each one of your nodes store a string or as wikipedia puts it, it is a trie where "each node with only one child is merged with its child". As I understand it the names radix tree and crit bit tree are only applied to trees storing integers and Patricia trie is retained for more general inputs. As usual I am outputting the code for each class. 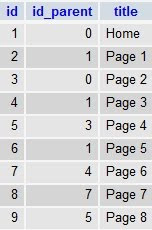 I was once asked to create a sitemap given a specific table structure. The parenthesis after the titles actually hold the value of the id of the node so they weren't in the original design but whatever. A real-world implementation would also have to include a link and print out elements but this is good enough for educational purposes. Each node also holds an array of subnodes. This is my implementation of a a prefix tree data structure in F#. This structure is described in more detail in a previous post of mine. I just describe the F# related stuff in the comments. I'm sure this is not the best implementation. I am aware this is not the most functional implementation ever. I am open to all constructive criticism of course. This is a follow up to my previous post on implementing a prefix tree in C#. This expands on that idea and uses the data structure to generate a list of autocomplete matches for a given input character sequence. A prefix tree is a data structure with many uses. I won't go into details about this data structure Wikipedia does a better job than I could. What I will do is post a C# implementation of this data structure and in a following post I will show how to use this data structure when implementing an auto-complete solution. this only works in sql server 2008 because earlier versions don't have the "xml" keyword. Well, you can find the path to a locally installed application by querying the windows registry. In PhpMyAdmin exporting data to sql statements not to .mdb files or other databases is very straight forward. When I first had to do this with Sql Management Studio I didn't know how at first. You now have a wizard that will help you generate scripts for the objects you need. You can either generate one script for all the objects in your database(tables, triggers, stored procedures etc) or one script for just some of the object(you choose which) or each object you choose in it's own script. You can either generate these resulting scripts in files or in new query windows. Everything is configurable from the options window(the wizard step with the title "Choose script options"). I wanted to just script the triggers in a db. Each in it's own file. In the options window I set "script triggers" to true and in the following wizard form(with the title "Output options") I chose "file per object". This is an interesting SQL problem that presented itself to me once. You have this table. It has of course a primary key which is an identity column which has a seed of 1. Then you insert a some data and then delete some data. The primary key column(let's call it id from now on) will no longer contain only consecutive numbers. So the question is: "How do you find the first non consecutive value in this column?" Well, the first thing that came to my mind at the time was making a cursor. That works too but it's not very efficient. is compressed but does not reside in a read-only database or filegroup. The file must be decompressed. 4. Selected .mdf file(should be blue if compressed ) Right click properties -> Advanced -> Uncheck "Compress files to save disk space"
When calling the file from the code write with two “\” where one is found in the path for example c:\\q.xml. The first element will never by shown anyway(assuming you do xdocOutput.Save(afile.xml)) so it can have any name. This is my implementation of a parallel sieve of Erathostenes in C#. I got the algorithm from here. I know I could have used some of the existing C# functionality to manage threads rather than doing it all myself but I found this more convenient at the time. Anyone is welcomed to bring any corrections. creates its share of lists. 2. Set k to 2, the first unmarked number on the list. Each process does this. a. Mark all multiples of k between k² and n.
c. Process 0 broadcasts k to rest of processes. 4. The unmarked numbers are primes. /// changes status of all worker threads to "DoingStuff"
/// changes status of all worker threads to "Waiting"
/// changes status of all worker threads to "Dead"
//Mark all multiples of k between k² and n.
//c. Process 0 broadcasts k to rest of processes. //1. Create a list of natural numbers 2, 3, 4, 5, ….., n.  None of which is marked.